The ancient land of Palestine debuts at OTDYKH Leisure 2018 with an exclusively built 40 sqm stand, displaying the culture and history of the country and specially the old city of Jerusalem. With a history that goes back more than one million years, Palestine has played an important role in human civilization. As the crossroads of prehistoric cultures, it is where developed a settled society, the alphabet, religion, and literature and would become a meeting place for diverse cultures and ideas that shaped the world we know today. If the knowledge of the common past helps to the best understanding of today world, that’s why tourist to Palestine growths every year. Ministry of Tourism and Antiquities announced that arrivals increased by over 350,000 foreign visitors reaching slightly over 2.7 million. More importantly, overnight stays also increased during the same period with Palestinian hotels registering over 1.7 million overnight stays. The top three source markets were Russia, USA and Romania. Other traditional source markets such as Germany and Italy were also among the top 10, along with new fast emerging markets such as India, Ukraine and China. Participation in OTDYKH Leisure 2018 aims to promote a better knowledge of the destination, showing the rich and diverse past, abundant cultural heritage and archaeological and religious sites of Palestine, including the birthplace of Jesus Christ, which make it a unique center of world history. In advance of the show, the task of reviewing all this history in the space of an article will be impossible; however we will try to give the readers the most important points of interest. For Palestinians, this cultural diversity is viewed as a source of wealth, and each part of the million years of settled life plays a part in the wider human heritage. This past makes up a large part of the contemporary Palestinian philosophy of sustainable development, which seeks to keep active the cultural identity of the Palestinian people. Visitors will encounter myriad religious, historical, and archaeological sites. But also offers walks and hikes in its extensive valleys, along coasts and desert hills, towns and ancient marketplaces at cities and villages nestled in breathtaking landscapes. Tourists will enjoy Palestine’s sumptuous cuisine and, most important, feel the warmth and hospitality of their people, Christians and Muslims alike, who will share with them the hopes and aspirations of a nation in the process of rebuilding. With its million years of human history and welcoming people, visitors sense the warm feeling of being at home. The Ministry of Tourism and Antiquities is cooperating with the private sector to create new packages under themes including trails that cover unknown sites in Palestine and aims to develop social responsible tourism, which means making better places for people to live and visit. Through this way, the Ministry seeks to provide tourists with enhanced services, cultural activities, economic opportunities and experiential tourism. 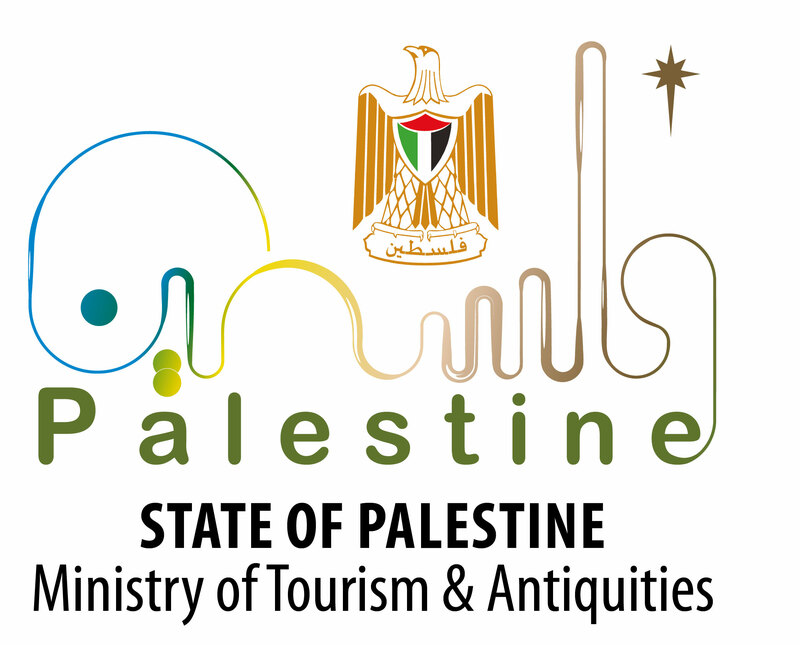 The aim is for tourists to explore Palestinian cultural heritage and enjoy the beauty and diversity of the landscape. The Ministry is very proud of the hospitality of the Palestinian people. Tourists feel at home as they meet the very hospitable and sociable local population who receive them with smiling faces and courteous tongues. According to many tourists who have recently visited Palestine, the population is well-behaved, gregarious and most hospitable. Visitors who seek for a unique and unforgettable journey can dive into the history of the earliest human settlement in Jericho and Wadi Khareitoun. They can trace the advent of urban society, the footsteps of prophets, or the path of Jesus Christ from birth to resurrection. Travelling from one city to another offers an eclectic mix of heritage. 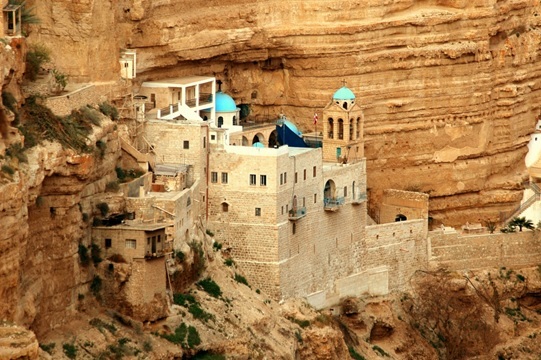 In Bethlehem, travelers can visit the Grotto of the Nativity where Jesus Christ was born, then turn southeast to the village of Beit Sahour where they can see the Shepherds’ Fields. Then moving southward along Hebron Road, will find the remains of an ancient water system: Solomon’s Pools and their extensive water canals. Farther down the road is the city of Hebron, a vibrant economic center home to the burial place of the prophets Ibrahim/ Abraham, Isaac, Jacob and their wives and one of the four sacred cities of Islam. Lying to the east is the Jordan River, where John baptized Jesus Christ. The sycamore tree that Zacchaeus climbed to see Christ walk to Jerusalem sits just inside the new city of Jericho; and to the west are the high cliffs of the Mount of Temptation. The Jordan Valley host several important points as the Dead Sea, where the famous Scrolls were found at Qumran; the oldest city on earth Tell es-Sultan, the sugar mills, and the nearby Hisham’s Palace; sites dating from the prehistoric periods through to the Bronze and Iron ages, up to the Persian, Hellenistic, Roman, Byzantine, Umayyad, Abbasid, Fatimid, Crusader, Ayyubid, Mamluk, and Ottoman times. Renting a bicycle or going by cable car to the mount, hundreds of thousands of years of history can be traced during an afternoon. Turning north, one finds the city of Jenin, one of the oldest inhabited places on the ancient plain of Marj Ibn Amer. At the southeastern edge, a few kilometers west of the city stands the IV century church of Burqin, marking the spot where Jesus healed ten lepers. Along this path, olive trees gradually give way to vineyards, which are dominant in the south, especially on the Hebron and Bethlehem hills. Stone terraces enclose the trees and vines along the mountain terrain to retain moisture and prevent soil erosion. South of Jenin is Nablus, nestled between two round mountains along the floor of the valley that connects them. Over the years, homes have growth up the hills with spectacular views of the city core. Visitors can walk through the historic market and dense old city center, with fabric shops, mosques and churches. 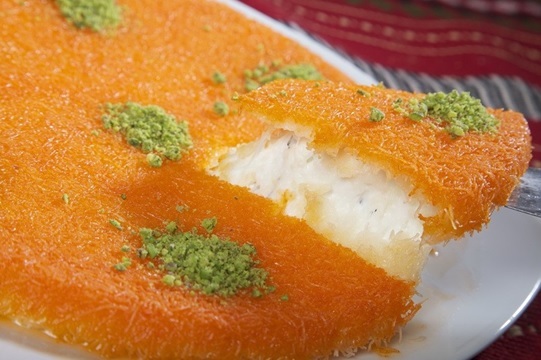 With a working olive-oil-soap factory, and home to Palestine’s favorite dessert, Nablus is the capital of the north. Nearby are the sister cities of Tulkarem and Qalqilya on the fringe of Palestine’s central mountainous ridge south of Marj Ibn Amer, and represent the central zone. The area played an important role in the past as a crossroads between the Mediterranean sea and the northern region, and today is the site of hundreds of archaeological features (Tell Taannek, Tell Jenin, Khirbet Bal’ama, Tell Dothan, Khirbet as-Samra, and Wadi Qana), about the region’s cultural history. This is also known as the breadbasket of the area, with farmers who grow wheat, olives, almonds, figs, and citrus. To the southwest, towards Palestine’s coast, is Gaza. Its old city market is a top attraction, as are archaeological sites such as Tell al-Ajjul, Tell es-Sakan, Tell al-Blakhyia, and Um Amer, as well as the newly excavated Byzantine churches that date back to the fourth and fifth centuries AD, only recently unearthed and renovated. The heart of Palestinian culture is, of course, Jerusalem. The city where Jesus Christ walked and spread his message of peace and love, where he spent his last days with loyal disciples, and where he was crucified, buried, and resurrected. 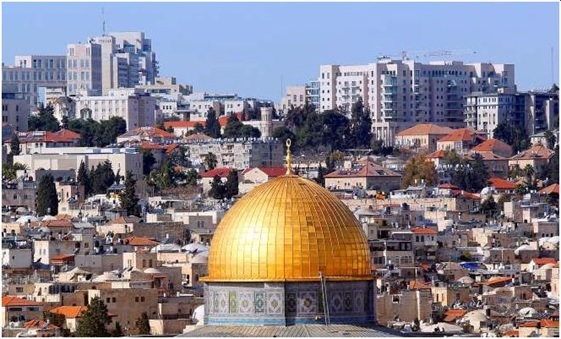 It is also in Jerusalem where one can visit the magnificent Dome of the Rock and Al-Aqsa Mosque, the third holiest mosque for Muslims and make the skyline of Jerusalem so iconic and unique. 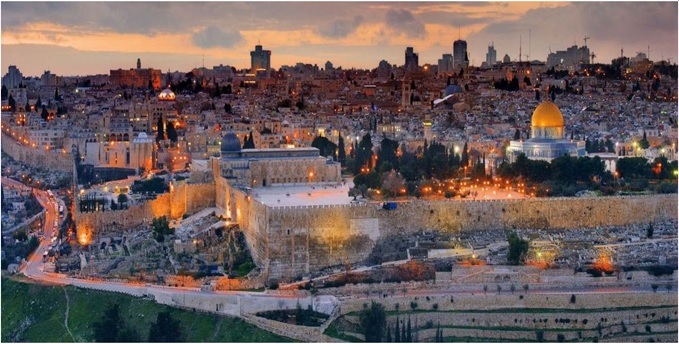 Jerusalem, a city that is considered holy for Islam, Christianity, and Judaism, is one of the oldest continuously inhabited cities in the world. Archaeological excavations show that the history of the city began more than 5,000 years ago. Among its 220 historic monuments are Al-Aqsa Mosque and the Dome of the Rock, built in the seventh century, which stand as magnificent pieces of architecture. It is also home to the Church of the Holy Sepulcher, which houses Christ’s tomb. The city has been known by various names throughout its history: Urusalim, Jebus, Aelia Capitolina, the City, Beit al-Maqdis, and Al-Quds. Jerusalem’s sites and long history present an exceptional testimony to vanished civilizations: the Bronze Age, the Iron Age, and the Hellenistic, Roman, Byzantine, Crusader, Umayyad, Abbasid, Fatimid, Ayyubid, Mamluk, and Ottoman periods. The Old City of Jerusalem, including its walls, is one of the best-preserved medieval Islamic cities in the world. It is divided into four main quarters: the Muslim, the Christian, the Armenian and the Jewish Quarter. The Old City has been home to many diverse cultures, which are reflected in the architecture and planning of the city and its sacred buildings, streets, markets, and residential quarters. Today, Jerusalem’s living traditions continue, making the city the heart of human history. In 1981, Jerusalem was inscribed on the list of the cities of World Heritage in Danger by the Hashemite Kingdom of Jordan. 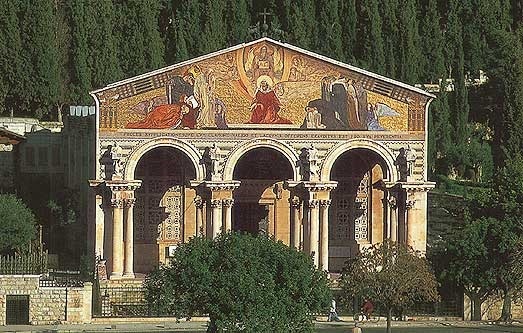 Located at the foot of the Mount of Olives, the Church of All Nations was originally built by the Byzantines in 379 AD over the place made holy by Jesus’ prayer and agony. The oldest real name is “The Basilica of the Agony”, but since the completion of the actual church’s construction in 1924 was done through donations collected from all around the catholic world, the name “Church of All Nations” became the name mostly used. The visitor can find several types of tours, from the classical introduction to the Christian pilgrimage which include multiple options (Jericho, Jerusalem, the Via Dolorosa and more). Another tour, designed to follow the steps of Jesus, is a spiritual, faith-based Jesus-centered pilgrimage following ancient paths based on his life on earth. 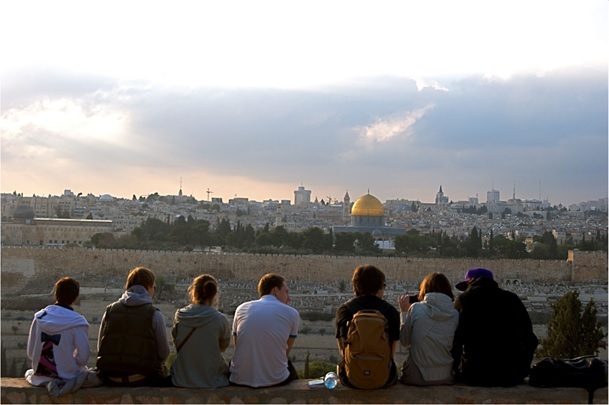 For visitors from other religions, there is the Islamic Heritage Pilgrimage Tour, that traces the Muslim faith between the Mediterranean and the Jordan River, from Jericho to the different mosques in Jerusalem, ending on Bethlehem to visit the birthplace of the prophet Issa in the Church of Nativity before returning to Jerusalem. A different type of tour is the Masar Ibrahim Al-Khalil, designed to discovere Palestine’s history, culture and beautiful landscapes. Is a long-distance hiking trail that runs through the West Bank from the Mediterranean olive groves of the highlands of the north to the silence of the deserts in the south; from the area west of Jenin to the area south of al-Haram al-Ibrahimi (Abraham’s mosque) in the city of Hebron. The trail was choose by National Geographic Traveller as number one walking trail in 2014. The 330km long Masar path can be hiked in parts reaching from day-tours to multiple-day trips or in around 3 weeks over its entire length. Several HLITOA tourism professionals offer assistance and full-service organization along the whole trail including local guiding, in-depth city guiding, arrangement of stays with local families and logistical support including luggage transportation. Last but not least, no visit to any country will be complete without a taste of their culinary specialties. Palestinian cuisine is varied and rich. The diversity of the landscape reflects also into the cuisine, from the succulent dishes of the Mediterranean coast to the inland hills with its olive oil scented gastronomy and the desert areas cook with thick yogurt-like pastes from goat milk. Tourist authorities have designed a tour entirely focused on the culinary heritage of Palestine, highlighting Arabic signature dishes and beverages through tastings, visits, and encounters with local farmers and cooking classes. Starting with an authentic hearty Jerusalemite breakfast of hummus, ful, falafel, salads and mint tea at a 1900 family restaurant in the Old City. That first day, for dinner, head to a famous BBQ restaurant, where lamb meat is traditionally cut using a large curved knife and be introduced to the famous mezze, a collection of Arabic salads and appetizers overnight in Bethlehem. Continue the second day with a visit to the Cremisan Monastery and Winery for a wine tasting as well as an overview about the history, culture, and difficulties of the clergy and the local Christian neighbourhood, and a simple but truly Palestinian falafel sandwich for lunch. For dinner, enjoy a truly Khalili dinner, including — upon prior arrangement — camel meat overnight in Bethlehem. On other stages of the tour, visitor will taste Palestinian-brewed beer, the famous Rukab ice-cream made with Arabic Gum, preparing a traditional meal at a Women Cooperative, and a traditional Palestinian-style dessert prepared with special semolina dough and goat cheese and drizzled with rosemary flavored syrup overnight in Jericho. Some of these delicious samples of the Palestine cuisine could be tasted at the Palestinian Stand at Otdykh Leisure 2018, The Home of the Tourism.